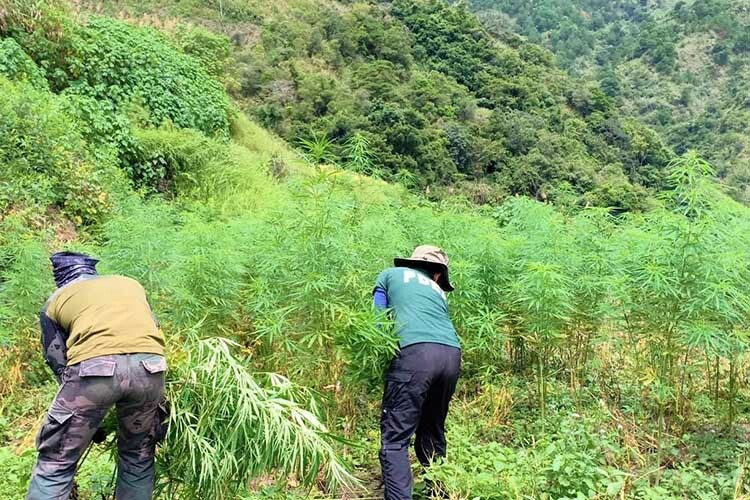 LA TRINIDAD, Benguet — Benguet Governor Crescencio Pacalso has called for a stop to the illegal cultivation of marijuana amid a monitored resurgence of planting cannabis in some areas of the province. “We ask them to stop planting, maybe until they are told that they are licensed to plant and not them just going ahead with the activity which is presently illegal. Let’s wait for the government to approve and tell us first that we can already go forward and plant,” Pacalso said. Pacalso said they are monitoring the resurgence of marijuana cultivation in areas already cleared of illegal drugs, which could be due to the ongoing talks about the legalization of medical marijuana. “The talks about the legalization of medical marijuana is very strong, it was already approved at the Lower House and ongoing at the Senate – which could be encouraging them [marijuana cultivators],” Pacalso said. The government has programs for farmers and instead of planting marijuana, Pacalso said the farmers should grow other kinds of produce. “What is clear is there are still those who are still planting and did not totally give up the cultivation,” Pacalso said. “They cannot just reason out, na wala kasing pagkitaan (that they do not have a source of income). Come out and ask for help. If the reason is livelihood, the government is doing its best to provide alternative livelihood. If they want to grow citrus, raise pigs and others, they can come forward and we will help them,” Pacalso said. Last month, solons approved on third and final reading House Bill 6517 or the Act Providing Compassionate and Right of Access to Medical Cannabis and Expanding Research into its Medicinal Properties and for Other Purposes. Once the bill is passed into law, this would allow medication made from marijuana extracts or oils. Pacalso said the provincial government would be willing to offer Benguet farmers work in legitimate marijuana plantation sites once the bill becomes a law. He said marijuana should be grown in designated farms that would not compete with Benguet’s salad vegetable areas. Pacalso advised his province-mates that if the bill legalizing medical marijuana is approved and becomes a law, there will be guidelines, and not just anybody planting. He added that permits would be required and those who would cultivate and process the plants would be identified in the guidelines. “It will still pass through several stages and they should not be deceived that marijuana cultivation will already be legalized if the bill passes into law and they can already plant,” Pacalso said in the vernacular. Pacalso told his constituents to study more about the proposed legalization of marijuana and how it would benefit them once it is passed into law. The planting stopped after President Rodrigo R. Duterte announced the government’s priority on the war against illegal drugs. Benguet police personnel recently conducted a marijuana eradication operation at Bakun, Benguet, which had been cleared of illegal drugs in 2017. Prior to Bakun, marijuana plantation sites were discovered at Kibungan town. For decades, some villages in the towns of Bakun, Kibungan and Kapangan in Benguet located at the tri-boundary with La Union and Ilocos Sur have been tagged as marijuana cultivation areas. Benguet, as well as other Cordillera provinces, has a suitable climate for marijuana plantation. Police Regional Office Cordillera Director, Chief Supt. Roland Nana, also appealed to the public to cooperate because law enforcers would continue to arrest violators.